Tumblr Outage Continues — Can It Pull a Twitter and Recover? Updated. The Tumblr blog-hosting platform has been down for more than 17 hours, in what appears to be the longest outage in the company’s history. Fans of the fast-growing service are grumbling about the downtime, and some competitors have tried to take advantage of the site’s stumble, while the startup’s only statement so far has been that it’s dealing with “an issue in one of our database clusters” and is “incredibly sorry for the inconvenience.” Twitter has shown that even a problem-plagued service can continue to grow if it is popular enough. 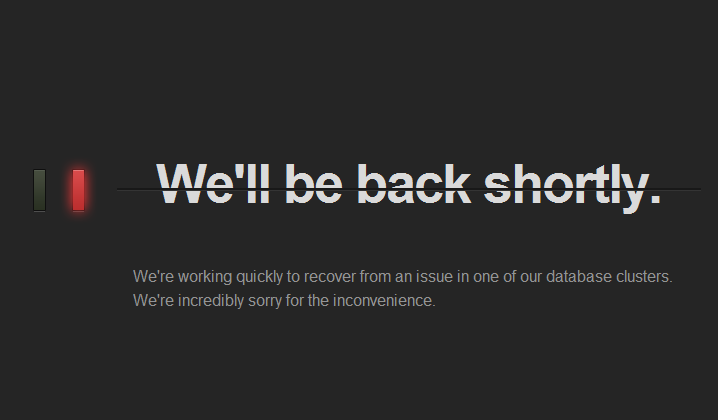 Does Tumblr fall into that category, or will the downtime send users away for good? The fact that the site has gone down probably isn’t that surprising, given the rapid rate at which it has been growing. According to a recent estimate from comScore (s scor), the number of monthly unique visitors to Tumblr have more than tripled, from about 2 million to more than 6 million, and the site had 1.2 billion page views in October, more than four times what it had just six months ago. Twitter was also growing at a tremendous rate when it suffered repeated outages in 2008 and 2009 — most of which were also related to its database structure — but the downtime didn’t seem to affect its long-term growth rate. Tumblr likely has the resources to fix whatever problems it’s having with its database or back-end; although it hasn’t been confirmed, industry sources say the three-year-old startup, which is run by 24-year-old founder and CEO David Karp, closed a huge new round of funding last month — estimated at $30 million — led by veteran Sand Hill Road VC firm Sequoia Capital. If true, that would value the company at close to $135 million. Although there are other blogging platforms that offer relatively easy publishing of content in the same way Tumblr does — including Posterous and WordPress (please see disclosure below) — the viral growth of Tumblr appears to be driven in large part by the “reblog” button on most Tumblr sites, which makes it extremely easy for users to re-publish or broadcast content from other users. It’s the blogging equivalent of the Facebook “like” button, or Twitter’s “re-tweet” function, which effectively allows fans of a site to promote that site’s content to their entire social graph. Some have mocked users for complaining about an outage at a company that offers the majority of its services for free (the company does charge for themes and other added features), but the dissatisfaction with Tumblr could have long-lasting effects. Unlike Twitter, which doesn’t really have any specific competition — unless you include Google (s goog) Buzz or open-source microblogging services such as Status.net — Tumblr is playing in a fairly competitive space, and needs to be careful not to alienate a core group of users. If there has been permanent data loss, that could definitely happen. Squarespace, a blog host that competes with Tumblr and WordPress and closed a funding round of $38 million earlier this year, tried to capitalize on the Tumblr downtime by posting an offer on Twitter on Monday, saying: “Enter code TUMBL at checkout & credit good for one free month of our standard plan will be applied to your account” (the platform’s standard plan is $12 a month). Update: Anthony Casalena, Squarespace’s founder, apologized for the post via Twitter and in the comments below, and the company has removed the offer. Tumblr came back up gradually on Monday and CEO David Karp published a blog post explaining the outage, calling it “absolutely unacceptable,” and said the company has quadrupled the size of its engineering team in the past month alone to try and keep up with the growth in demand. dude, can tell you don’t use tumblr. I agree with Mike..this is ridiculous. I can barely do anything with tumblr spazzing randomly when I’m trying to post my work. I really hope that holds out true but remember, data is the only irreplaceable asset of an organization. Once it’s gone, it’s gone. The point I am trying to make is having access to cash in the bank + large userbase + really smart engineers doesn’t provide any guarantee that your data will be safe in case of a disaster. Times like these can be of incredible stress on those handling the situation. I feel for folks at Tumblr and hoping for a speedy recovery. Good luck Tumblr guys! You’re in my thoughts. At this point I just want to know from Tumblr what is happening. It’s been over 24 hours now and I am reasonably convinced that they have had a completely data loss event. I understand that Tumblr is a free site, but so is Facebook and Twitter, and so I just want to know if I can expect my data to be there or not. WITH OUT TUMBLR I AM NOTHING. BABY, COME BACK. I NEED YOU. PAPA NEEDS MAMA. Hi — this is Anthony from Squarespace. The tweet that went out was completely unauthorized by anyone actually in control on our marketing team. We have removed the tweet and dealt with it internally. It is not in the spirit of our company to say something to this effect — and is a complete embarrassment. As someone who has run a company and dealt with infrastructure issues personally, my heart goes out to everyone at Tumblr and I hope for a speedy recovery. It’s an awful thing to deal with. Thanks, Anthony. The post has been updated to reflect that. Right? We are freaking out. We love Tumblr even through repeated eff ups. 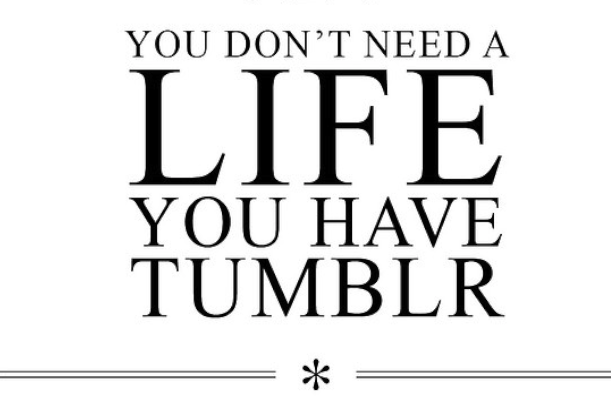 Without Tumblr we are FOREVER ALONE! :(Baby come back. I tried to get on Tumblr last night and i’ve been trying for hours since. I hope Tumblr can recover from this outage and i hope even new Tumblr users will stick with it.